Today is the last day to purchase the Snow is Glistening stamp set. I have really enjoyed creating with this set! 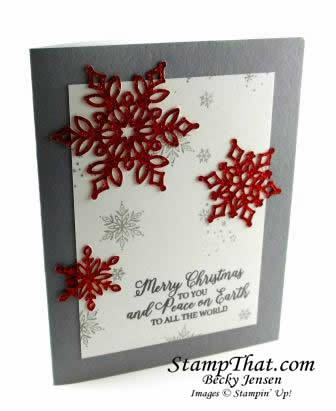 The stamped images are so detailed and stunning while the dies are some of my absolute favorites! It’s only natural that we used the set in our Christmas Card Class last evening. Check out this lovely card! It took a little work to punch the pieces out of the snowflakes, but it was worth it for this card! The stamped images you see are all from the Snow is Glistening stamp set, and the dies are from the Snowfall Thinlits Dies. Both of these are available today and then they will be gone. Don’t miss out on them! You can place an order in my Stampin’ Up! Online Store or I will be happy to place it for you.